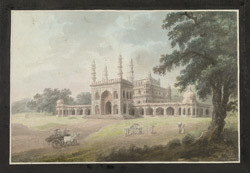 Watercolour of the Mausoleum of Akbar at Sikandra near Agra, by an anonymous artist working in the Calcutta style, part of the Wellesley Albums, c.1798 - 1804. Dated inscriptions show that the tomb was completed by Akbar's son Jahangir (r.1605-27) in 1614. It is set in a vast square garden of the 'chahar bagh' plan, a formal garden divided into four sections by red sandstone causeways containing water channels, interspersed with fountains and ponds. The main entrance is on the south and ornamental false gateways are on the other three sides to create symmetry. The monumental main gateway, seen in this drawing, is in a hybrid style that includes Persian and Hindu elements and is made of red sandstone with inlay mosaic patterns of floral and geometric shapes. The mausoleum has four white marble minarets at the corners of its roof and is divided into three storeys by balconies and is topped with domed pavilions.